Any fan of "In The Aeroplane Over The Sea" will agree that there is no better way to listen to the album than on vinyl and I wholeheartedly agree. I also believe that the combination of the raw NES sound and vinyl offers a similarly unique listening experience but without knowing what sort of demand there will be, I am unable to invest to meet the minimums that many production companies require. Additionally, royalties will be paid in advance so that the copyright holders are properly compensated before the album is officially released. With the help of this campaign and you, the backers, I'll not only be able to offer a great quality vinyl record, packaging & extras but will also be able to gauge overall interest in the album after the campaign ends for digital distribution options and a potential CD digipak run. Funds left after covering royalties and fulfilling all rewards will be allocated directly to these and further royalty payments to cover both physical and digital options moving forward. All of the music on this album was created using the Audio Processing Unit inside of the North American release of the Nintendo Entertainment System - the Ricoh 2A03, or RP2A03. In the rest of the world, however, the console used the RP2A07 model of the processor. While I've utilized the APU onboard the 03 for this album, I decided to go with a more concise and inclusive reference "RP2A" for the album title. I've been creating chiptune music for over a decade and have been composing/arranging video game style themes since I was a child. When my family acquired a new home computer in the early 90's, I took an immense interest in using it to orchestrate melodies. At the time, I had been playing piano for most of my young life and was in the habit of teaching myself how to play theme songs from my favorite TV shows, movies and video games from the 80's. After discovering the possibilities of using a digital audio workstation to create music, I went on to spend countless hours of my youth arranging and composing Midi based tracks - and I have been doing it ever since. Prior to the start of the campaign, I commissioned Austin Signal to lathe a vinyl copy of the album for me to listen to so I can adjust levels before sending the tracks for the final press. Listen to the full album below on vinyl, playing on a Nintendo I made into a turntable! Keep in mind, this is not a good quality player (I shoved a low-end suitcase turntable into a Nintendo, after all) and this is also an earlier version of the album - since this vinyl was lathed, I've tightened up things and cleaned up the tracks considerably! Of course, the reason you are here is that you get something out of this deal! I've offered digital downloads for all of my previously released albums but for 8-Bit Jesus, I also went all in on a 6-panel CD digipak designed by the very talented illustrator and pixel artist Jude Buffum. While the aforementioned was sufficient for those projects, I feel that this one deserves something better tailored to the source material. My setup includes a pro-sound modded Nintendo Entertainment System which significantly improves sound quality. In addition to eliminating the horrible humming sound that the NES makes, it separates the 5 channels into two 1/4" stereo outputs which allow me to adjust levels on a mixer before recording to ensure everything sounds perfect. As a result, the sound on this album is far superior to that of the standard audio output inherent on the stock Nintendo Entertainment System. This digital download has also been rendered at an 'insane' 320kbps for the best listening experience. Setup used to create "In The RP2A Over The Sea"
For this album, I wanted to recreate both the sound of the original tracks and the look of the original album art. 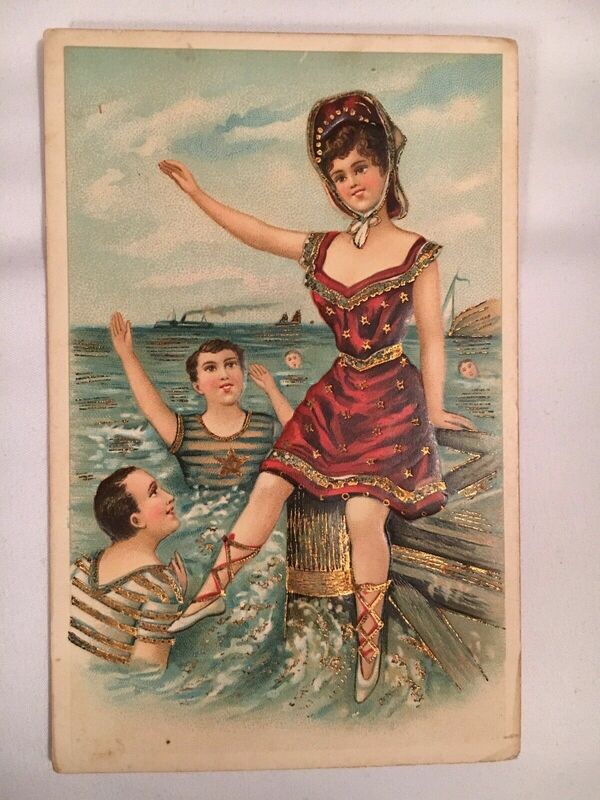 I was pleased to discover that the infamous Bathing Beauty artwork on the original cover was based on a vintage European postcard so that I would be able to reference it for the front cover of my record without stepping on Chris Bilheimer's toes. In addition to the album cover pixel art, I also created an Announcement design inspired by the original album jacket art, which is featured on this printed insert. This 18x24" poster features the same Bathing Beauty pixel artwork from the front cover of this album with an extended area of the image shown on top and bottom to match the poster's dimensions. Posters included with any reward level will be shipped in a rigid cardboard tube mailer to preserve the condition. For anyone backing the $25 level specifically, the printed insert will also be shipped in this tube mailer, along with a sticker! This is what it's all about and the primary reason for this Kickstarter. For the truest listening experience, nothing is better than vinyl. In addition to a quality recording on a standard black vinyl, you get the Bathing Beauty pixel artwork on a premium jacket with a 3mm spine, color label on both sides of the record, black protective poly-lined sleeve, the printed insert with the Announcement design, and the complete album package will come in a clear protective poly bag to keep it dust free when you're not listening. With this reward, you also get digital downloads of my previously released After These Messages and Shamroctoroc albums, plus a fun sticker. The Special Edition album comes with everything included in the standard vinyl press package, plus the 18x24" Bathing Beauty poster, a collection of four 5x7" original pixel art prints based on the album theme, and as an added bonus, I'll throw in a physical copy of the 8-Bit Jesus 6-panel digipak (a $12 value!). For those interested in the process of creating an album using only a Nintendo or looking to get into making authentic chiptune music, this hour long, one-on-one screen share session will walk you through my process of creating the album. I'll share with you what software & hardware I use, how I work within the inherent limitations of the sound chip, utilize creative techniques, and more! I will also answer any questions you have or we can just chat about classic video games, art, music, technology, etc. This reward includes everything that comes with the Special Edition Vinyl Press. After previous album releases, I've received commissions for custom chiptune tracks - usually based on other themes or songs, but also originals - so I thought it would be fun to offer select backers the same service bundled with the album. You get everything included with the Special Edition Vinyl Press, plus I'll arrange/compose a track just for you using the same setup I used for this album. This can be an original track or an arrangement, up to five minutes in length - it's up to you! The track will be sent to you as a high quality MP3 when completed, along with a custom pixel art cover image to accompany it in your music app. Kickstarter is all about transparency and accountability so I'm providing backers with an account of how all of the funds will be allocated. Much of the funds, anywhere between a third and half of the total depending on how much is raised, are going to pressing the vinyl records, printing the jackets & record labels, and providing the protective inner sleeves. I'll be using Kindercore Vinyl for the press and Imprint Indie Printing for the album packaging. I've had my application for all of the tracks on this album approved by Easy Song Licensing and will be sending advanced royalty payments upon the completion of this campaign (I've also spoken directly with Jeff Mangum's lawyer in order to get approval of the content on the album). Royalties account for about one quarter of the funding goal. For all reward levels over $25, a printed insert featuring the Announcement pixel artwork will be included. I'll be sending these to Imprint Indie Printing, who are widely regarded in the industry as one of the the best sources for album packaging. These colorful 18x24" gloss-finish posters, featuring the Bathing Beauty pixel artwork from the cover, will be printed through Discmakers. I'll be enlisting the services of my local print shop for these original pixel art prints, included with the Special Edition Vinyl Press. Support your local small businesses! As a fun extra and a hearty thanks to all backers of physical rewards, I'll be including round, 2x2" stickers featuring the pixel Jeff Mangum that has been accompanying the campaign updates. You can see the design for this sticker in this update. I'm offering *free shipping for all rewards within the continental U.S. so these costs have been factored into the goal. To ensure that everything arrives safely, I'll be purchasing heavy-duty vinyl mailers & stiffeners for shipping the albums and rigid tube mailers for the posters, in addition to a lot of packing tape and clear, self-adhesive packing slip sleeves to help expedite the process. *supplemental shipping will be added for backers in Europe, the UK, Ireland and Canada. If you are from a country not currently on the list and wish to back a physical reward, please contact me and I will estimate the shipping to see if it can be added to the list! While many vinyl pressing plants offer shrink wrapping, I've decided to pass on this in lieu of better quality, clear, resealable poly bags. These are similar to the protective sleeves that many collectors use to preserve their vintage vinyl collections. I've done meticulous calculations and price-sourcing to determine the outcome of this project whether it barely reaches the goal or maxes out every reward. If the campaign just meets its goal, I will have a small buffer to cover anything that doesn't go according to plan or to put toward future offerings of the album (digital or physical). If it reaches its peak potential, however, then I will be upgrading every reward in some way. If the campaign reaches $8,000, all records will be pressed in crystal clear vinyl instead of black and the labels will be upgraded as well. This is something I really wanted to do from the start but it was very cost prohibitive through my previous choice of pressing plant. However, since switching to Kindercore Vinyl, reaching this stretch goal will make clear vinyl possible for all records! For the backers of rewards that include the vinyl press, I'll also be upgrading the poly sleeve and throwing in a custom sticker with every reward at $25 or above. Check out this update to see the sticker design! For rewards that include the Special Edition Vinyl Press ($65 and above), at $9,000 I'll be adding four additional pixel art prints to the collection. This second set follows a more vivid color palette and each one contains original artwork inspired by song lyrics from the original album. This stretch goal will also see these designs added to the download as digital album artwork to give everyone more choices in their music app. Can you guess which song each of the prints references? Should we surpass $10,000 then all album jackets will be upgraded to a gatefold design and inserts will be upgraded to double-sided prints with the Announcement design on one side and additional information about the album and backers on the other! In the case that we exceed $11,000, I will be performing a live streaming set of the entire album directly from my Nintendo with graphic visualization of the arrangement during which viewers can ask questions via chat. The exact date for this has yet to be determined but I'm aiming to do this during the second or third week of April while I await delivery of the components to fulfill physical rewards. All backers will be invited and welcome to share it with their friends. For anyone unable to attend the live stream, the video of this performance will be available after the fact so no one misses out on the experience! If the indie rock and chiptune gods simultaneously smile upon us and the campaign goes beyond $12,000, I'll be pulling out all of the stops! In addition to all previous stretch goals above, every vinyl album will get a printed protective inner sleeve and a hard back, 'tip-on' style gatefold jacket, plus I'll create four more pixel art prints (for a total of 12) for those who backed rewards that include the Special Edition Vinyl Press! These additional prints will also be based on songs from the original album and, as you may have guessed, will be included as cover artwork for the digital download of the album. As of now, the entire album is recorded, mastered & backed up on multiple devices. I've also received the lathe-cut vinyl from Austin Signal and listened to it on multiple record players so I now have an excellent idea of what the full run press will sound like before submitting the master recordings. In addition, I will have test pressings and artwork proofs sent to me so I can make additional adjustments to the recordings and color correct the artwork so everything comes out sounding and looking exactly as it should. Having said that, there is always a risk that comes with relying on third parties for production elements. I have a local source for the Special Edition pixel art prints and I'll be picking up the posters from Discmakers myself (they're a half hour drive from me) but as I'll be using out of state sources to produce the inserts and vinyl packages, I am depending on those vendors and shipping companies to do their part to get these assets to me as planned so I can deliver rewards in a timely manner. I'm hoping to take a road trip to pick up the records from Kindercore when they are finished to minimize any risks associated with transporting them. The challenge ahead will be organizing orders, packing them for transport and handling all of the shipping, but I've taken great care to plan ahead with everything from packaging materials to shipping labels. I'm putting a bit extra toward these supplies to both ensure safe travel through the post and to make the process go quickly and smoothly. Reward delivery dates have been conservatively set to account for unexpected snags so they will likely arrive well ahead of schedule but in the event of delays, updates will be posted regularly and digital rewards will be delivered right after the close of the campaign regardless, so you can start listening to the album right away! Digital download of the full album in high quality with HD digital album pixel art. Digital album download, plus the printed insert, plus the 18x24" poster of the 'Bathing Beauty' album cover pixel artwork. Digital album download, plus a vinyl press of the album that includes the printed insert, plus digital downloads of my "After These Messages" and "Shamroctoroc" albums! Digital album download, plus a special edition vinyl press of the album that includes the printed insert, poster, and four 5x7" art prints featuring exclusive pixel artwork. You'll also get digital downloads of my "After These Messages" and "Shamroctoroc" albums, plus I'll throw in a physical copy of the 6-panel "8-Bit Jesus" digipak! Everything included with the "Special Edition Vinyl Press" reward, plus we'll schedule an hour-long screen share session where I'll answer questions and show you how I made the album! Everything included with the "Special Edition Vinyl Press" reward, plus I'll create a custom chiptune track based on any tune of your choosing (or something completely original) up to 5 minutes long!